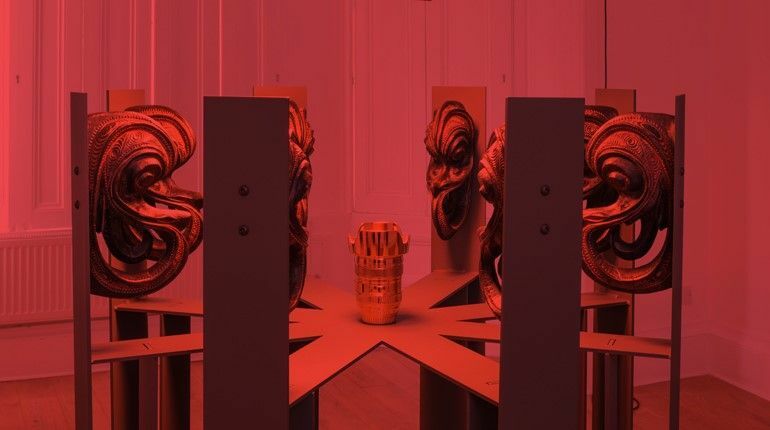 Steven Claydon presents an exhibition comprising three new sculptural installation works in a major new commission for Reading International. The exhibition, The Outside In, can be seen at MERL (the Museum of English Rural Life) in Reading until 13 January 2019 and is part of the MERL’s current programme focusing on folk culture. The exhibition examines the construction of concepts such as Englishness through museum displays, exploring how objects take on new significance when placed in museums, and how museums construct narratives through the recontextualisation of objects from elsewhere. The three new installations are part of a larger display combining objects from Claydon’s personal collection, with a particular focus on Melanesian folk objects. This combined display alters the viewer’s perception of the objects; through arrangement and selection the objects chatter with established and new narratives and questions. “My work has always been concerned with the ways objects are housed. This might be a storage crate or shipping container, a vitrine or a pedestal. The way we present objects in domestic, commercial and institutional settings affects the way things are read and the way they speak. I think of objects as ‘live’ but I am also keenly aware of the way they are pressed into the service of a noble cause or cultural conceit. I use and confuse the language of museum architecture, window display and logistics/storage to highlight the activity of objects and reinvest them with a kind of urgency or tension that is sometimes lost.” - Steven Claydon. Read full interview. The incorporation of objects from Melanesia and New Guinea highlights the way objects with specific local function and significance are moved to drastically different environments, taking on new significance there. The objects interact with others in the permanent collection at the MERL. These interactions are a critical reflection on the purpose and politics of the removal and recontextualisation of objects, and the role the display of objects from distant places and cultures plays in the construction of contrasts: ideas of the exotic and familiar, distant and local, inside and outside. “The remoteness of the location where these artefacts were made and ritually ‘used’, and from which they then globally migrate, adds to their intrinsic activity and agency. I was interested in that physical journey and in the conceptual journey from local, everyday efficacy to ethnographic objet d’art. [...] I wanted the pieces from my collection to be able to shed new light on the indigenous objects at The MERL through their similarities and their alterity or ‘otherness’; to catalyse a re-reading via an altered context.” - Steven Claydon. Read full interview. The Outside In is at the Museum of English Rural Life, Redlands Road Reading, Berkshire, England RG1 5EX until 13 January 2019.